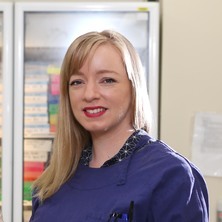 Annalicia Vaughan is a Post-Dostoral Research Fellow at the UQ Thoracic Research Centre at The Prince Charles Hospital. She was recently awarded a Research Fellowship from The Prince Charles Hospital Foundation to investigate high fibre diet as a novel therapy in COPD. Her current research focuses on the effect of dietary fibre supplementation on the microbiome and inflammation in COPD. Her broad research interests include the prevention and management of COPD, and the identification of novel interventions to protect vulnerable lungs from air pollution exposure. Dietary fiber as an immune regulator and potential novel therapy for COPD. Vaughan, Annalicia, Stevanovic, Svetlana, Jafari, Mohammad, Miljevic, Branka, Ristovski, Zoran, Bowman, Rayleen, Fong, Kwun and Yang, Ian (2017). Effects of N-Acetylcysteine Intervention in Vitro On Primary Human Bronchial Epithelial Cells Exposed to Diesel Emissions. In: Respirology. , , (123-123). .
Vaughan, A., Stevanovic, S., Jafari, M., Miljevic, B., Ristovski, Z., Bowman, R. V., Fong, K. M. and Yang, I. A. (2017). Reducing The Toxicity Of Diesel Emission Exposure On Primary Human Bronchial Epithelial Cells Cultured At An Air-Liquid Interface. In: American Journal of Respiratory and Critical Care Medicine. International Conference of the American-Thoracic-Society (ATS), Washington Afghanistan, (). May 19-24, 2017. Vaughan, A., Stevanovic, S., Miljevic, B., Ristovski, Z., Relan, V, Goh, F., Bowman, R., Fong, K. and Yang, I (2014). Diesel Emission Composition Mediates Cellular Responses of Primary Human Bronchial Epithelial Cells At An Air-Liquid Interface in Vitro. In: Respirology. , , (63-63). .